White-winged doves are large, chunky members of the doves family Columbidae. Adult birds are brownish-gray, with distinctive white wing bars visible at rest and in flight.. Males and females have similar plumage, both with an orbital ring of blue featherless skin, a black “ear spot” beneath the eye, red irises, and pinkish-red legs and feet. Males tend to be slightly larger than females, with a hint of iridescent purple on the neck and head. Juveniles have black irises, and no blue eye ring. Though most dove species are conspicuous enough to easily identify, many dove surveys are done using "coo-counts" insteda of visual identification, so differentiating between species is crucial. Check out the difference between the two most common doves in Texas. the white-winged dove and mourning dove. The native range of the white-winged dove extends from the southwestern U.S. through Mexico and Central America, into parts of western South America. The majority of white-winged doves are seasonally migratory, with a breeding season in the southwestern United States from April-September, and wintering grounds in Mexico and Central America, the desert southwest has some permanent residents. The area with the highest historical white-winged density is the Rio Grande River Valley in south Texas, with a concentrated population in the several millions over a hundred years ago. After wholesale destruction of their nesting habitat (scrub forest) for conversion to citrus plantations, the populations fell to several hundred thousand. The white-winged dove then switched its nesting preferences to citrus trees, and has been rebounding since. After the initial rebound, an increase in white-winged dove began to be noticed throughout south and central Texas. Though occurring in reduced density, the white-wing began to expand north and east, and populations in the west swelled. 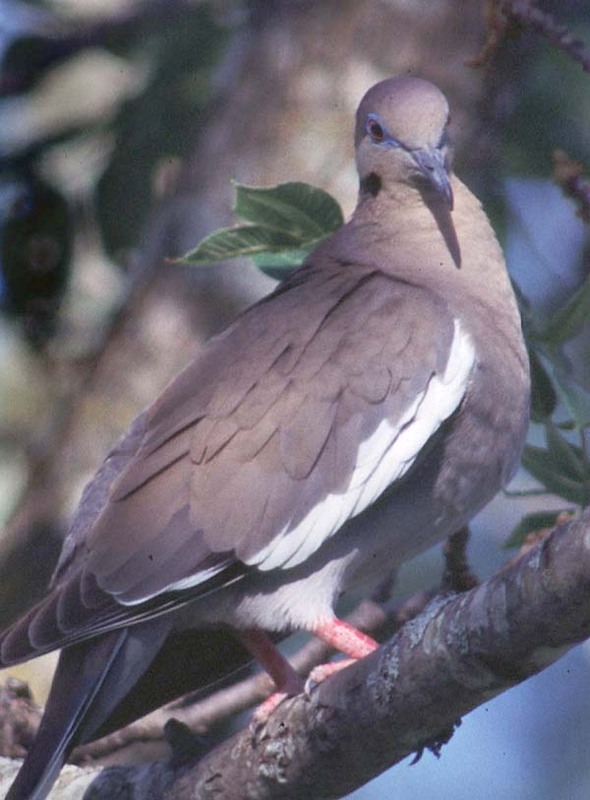 The white-winged dove is currently found over the majority of the United States in low density, while novel areas of high density can be found in Texas, Florida, Arizona and Louisiana. This distribution is the result of gradual range expansion following expansion of agricultural lands, and concomitant suburban expansion. The nature of suburban areas creates a savanna like setting ideal for dove nesting, and agricultural lands in some areas offer a year round food source, enabling birds to overwinter. The white-winged dove is a home grown exotic. By definition, this native species has expanded beyond its historical boundaries without a specific introduction event. The only known introduction event was in south Florida in the 1970’s, where several hundred birds were released from an aviary. Because of the popularity in dove hunting, it is not unlikely that the northern expansion of these doves has been augmented by humans transport to stock fields for recreational shooting, however, this has not been officially documented. The historical range of the white-winged dove has been augmented by the expansion of available food resources, rather than by an ‘introduction’ event. Despite mounting hunting pressures, the white-winged dove is still able to expand its range northward by approximately 20 km per year, due to increasing grain production, a feeding niche the white-wing has recently begun to exploit. White-winged dove were deliberately introduced into southern Florida from an aviary, those populations have established and are nesting in citrus groves and feeding in suburban areas. The white-winged dove has been able to expand its range because of increasing agricultural lands in the southwest. These additional food sources and the concomitant suburban habitat expansion have offered both increased food and nesting resources for the white-winged dove. Their larger body size enables them to more effectively out compete mourning doves sharing similar food and nesting resources. In addition, their plastic nature with respect to these two resources has served them well, as humans land use change has altered their preferred nesting spots, and food availability. White-winged doves appear to more readily adapt to new resources than closely related species. White-winged doves feed on a variety of wild and domestic seeds, grain, and fruit depending on their range and seasonal availability. Domestic grain crops include sunflower, barley, sesame, sorghum, wheat, corn, and safflower. These doves are important seed dispersers and pollinators, especially of columnar cacti such as the saguaro (Carnegia gigantea) in western states. The cactus pollen, nectar, fruit and seed provide practicaly all of the obtainable food and moisture for the desert white-winged doves in summer months. White-winged doves regurgitate cactus fruit for their young; after digestion these seeds fall to the shaded ground beneath the nest. Saguaro seeds are shade dependent for germination; tightly linking the dove to the desert ecosystem of the southwest. Being a prey item is another important ecosystem role, and white-winged doves are hunted by a variety of predators. Young and adults are taken during nesting season by raptors; eggs and nestlings are most often predated by Great-tailed Grackles (Quiscalus mexicanus) and Mexican Crows (Corvis imparatus). With the arrival of agriculture in southwestern North America, western white-winged doves’ range has expanded into areas beyond the saguaroís distribution in response to newly available food resources. With the advent of new food and watering resources, it remains to be seen if the white-wing will remain intrinsically linked to the saguaro cactus, or if it will switch its food source to easily obtained agricultural grains, a move that would be disastrous for the cactus populations of the southwest. The white-winged dove is an important cultural symbol of the southwest to many. The hunting cultures of Texas and Louisiana celebrate dove hunting, and enact practices to increase dove populations, such as offering watering areas in times of drought, and spreading corn in open areas to attract birds during open season. Because the white-winged dove is native to parts of Texas, it is an important natural prey item for several bird and mammal species, and its increasing numbers may aid in maintaining populations of these predators. Since they are also important seed dispersers and pollinators, particularly in the Southwest, augmenting their numbers may help the persistence of saguaro cactus (Carnegia gigantea) populations. White-winged doves share similar feeding and nesting niches to several other dove species, including the common ground dove and the mourning dove. Similar niches not only lead to increased interspecific competition, but increased risk of disease and parasite transmission. In urban and suburban areas, the white-winged dove has been shown to have a significant negative correlation with mourning dove and common ground dove populations. White-winged doves, with their larger body size and increasingly generalist feeding tendencies, may feasibly be out competing these other two species. Close feeding quarters also render the mourning dove at high risk for contracting Trichomoniasis, caused by the protozoan Trichomonas gallinae and vectored by white-wings. T. gallinae appears to be non-pathogenic to the white-winged dove, but lethal for the mourning dove . As white-winged doves increase their range, the risk of contracting T. gallinae increases for the mourning dove as long as an overlap in feeding niches remain. In the event that white-winged doves continue to increase their range into urban and suburban habitats, the greatest threat posed to humans appears to be building fouling. Its cousin the common city pigeon, perches on building ledges and the resultant defecation is considered an ascetic menace. A similar situation may occur with white-winged doves if its populations continue to expand into cities. "Minimal Priority " - newly introduced, of little threat. I would recommend that the white-winged dove be controlled with only with increased bag limits in hunting season in the newly colonized regions. The white-winged dove is not currently thought to be a significant threat to other bird species, although future research to determine interspecific competition is needed. Like several other dove species, the white-winged is able to increase its range because of increasing human land use change, a trend which is unlikely to slow in the foreseeable future. Opening or increasing bag limits in northern and eastern areas of its new range will likely slow the inevitable expansion into these areas, and allow researchers to determine the relative impacts of white-winged doves on other avifauna. White-winged have not yet been controlled as an invasive species. Population numbers have historically been kept in check through hunting. The current season on white-winged doves in Texas (their native home-range) is September 7, 8, 14, and 15th, on properties within south Texas, where the daily bag limit is 10. White-winged doves currently nest in trees and shrubs, and evidence exists to suggest that they are increasingly adapted to urban and suburban areas. If their general plastic nature allows them to shift nesting preferences, the white-winged dove may too become an urban pest. If this occurs, control is likely to be similar to that of the rock dove (Columbia livia),a common trash bird in urban areas. The general approach used to reduce rock dove populations is nesting site prevention. Short term solutions to the pigeon fouling problem have been spiking or wiring off roosting ledges. Longer term solutions include shooting, which though highly effective is difficult to enact in highly populated urban areas. Trapping is more time consuming but can effectively reduce pigeon populations. Chemiosterilants are chemicals that sterilize the pigeon for several months, however the only product available for this use is Ornitrol, which was taken off the market by the manufacturer in 1994, and not considered very effective. Conti, J. A. and D. J. Forrester. 1981. Interrelationships of parasites of White-winged doves and Mourning doves in Florida. J. Wildl. Dis. 17: 529-536. Cottam, C., J. B. Trefethen. 1968 White-wings: The life history, status and management of the White-winged Dove. D. Van Nostrand Company, Inc. Princeton, NJ. Enserink, M., 1999. Predicting Invaders, Biological Invaders Sweep in. Science. 285 (5435): 1834-1836. Ehrlich, P., Dobkin, D., and Wheye, D. (1988). The Birders Handbook: A Field Guide to the Natural History of North American Birds. New York: Simon and Schuster Inc.
Geissler, P. H. and J. R. Sauer. 1990. Topics in route-regression analysis. Pages 54-57 in J. R. Sauer and S. Droege, editors. Survey Designs and Statistical Methods for the estimation of Avian Population Trends. U. S. Fish and Wildlife Service Biological Report 90(1). Kolar, C. S. and D. M. Lodge. 2001. Progress in Invasion Biology: Predicting Invaders. Trends in Ecology and Evolution. 16: 199-204. for 2 OCT 01. Waggergman, G. 2001. White-winged dove and White-tipped dove density, distribution, and harvest. Perf Rep., Fed. Aid Project. W-128-R-9, Job 2. Texas Parks and Wildlife Dep. Austin, TX. Waggerman, G. 2002. White-winged doves, in Birds of North America. In Press. A Texas Parks and Wildlife page with identification tips, and links to hunting regulations for the south Texas region. The Patuxent Bird Population Center's white-winged dove page. They have incredible range data and natural history for nearly everything avian you could ever want. Birdsource is a wonderful place for learning about bird trends, like dove expansion! Random, but this newspaper article gives a sense about the way white-winged dove expansion is percieved of in Texas, an opportunity for more hunting. Gary Waggerman, who is quoted several times within this article is the leading expert on white-winged doves, and works with Texas Parks and Wildlife.